Quetzals are solitary birds that are poor flyers. There are four species of quetzals; they live in South and Central American rainforests, and are in danger of extinction. These brilliantly-colored bird were sacred to the Mayans, and figured prominently in their legends and art. Quetzals do not survive in captivity. The male quetzal has tail feathers that are up to three feet (1 m) long. The female’s tail is much shorter. 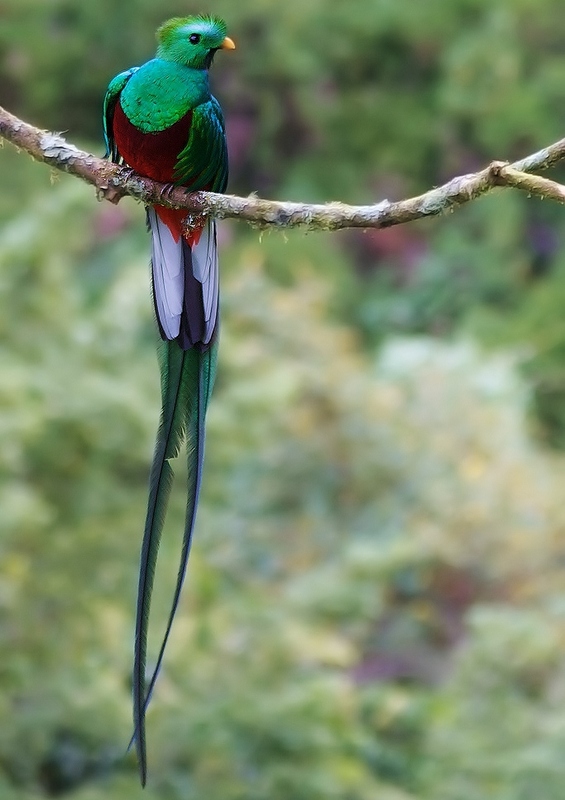 Quetzals eat mostly fruit, but also eat worms, frogs, insects, larvae, and snails. Quetzals nest in rotting trees. The female lays 1 to 2 light blue eggs. The incubation period is 18 days. Both parents incubate the eggs and feed the hatchlings.